Imagine a huge soup plate that slowly fills up with water and overflows in the rainy season, gradually empties during the dry season and then starts to fill up all over again. That image gives a good idea of what the Pantanal is like; a unique, rich, but threatened ecosystem located in Brazil, Bolivia and Paraguay. The environmental exuberance of the Pantanal, its biodiversity and extraordinary landscapes are all part of the video on the Pantanal produced by WWF-Brazil in partnership with WWF-Bolivia. The 6 minute-long video also shows the impacts the region has been suffering, sustainable production projects and alternatives designed to contribute to the conservation of the Pantanal that WWF is supporting in Brazil and Bolivia. Among them are: certified organic beef cattle ranching, monitoring impacts, environmental education, land tenure regularization, and public and private protected areas. The Pantanal is highlighted in red. Extending hundreds of thousands of square kilometres across central-western Brazil, eastern Bolivia and eastern Paraguay, the Pantanal is a mosaic of flooded grasslands, savannas and tropical forests. This pristine landscape is brimming with the greatest concentration of wildlife in South America. Among the rarest animals to inhabit the wetland are the jaguar (Panthera onca), hyacinth macaw (Anodorhyncus hyacinthinus), giant river otter (Pteroneura brasiliensis) and marsh deer (Blastocerus dichotomus). Thousands of water bird, plant, fish and reptile species thrive in the endless patchwork of lakes, lagoons, rivers and marshes. Although large areas of the Pantanal remain untouched, it is threatened by expanding human settlement, unsustainable farming practices, illegal mining, hydroelectric power plant construction and unregulated tourism. When compared to other wetlands in the world, the Pantanal is regarded as the most preserved, but still less than 2% is under government protection. WWF is working on the ground to conserve the region through the creation of protected areas and promoting sustainable use of natural resources. 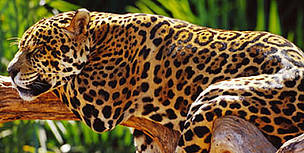 Revered and feared, the jaguar is the biggest cat species in the Americas. The Pantanal is bounded by the Chiquitano dry forests to the west and northwest, by the Arid Chaco dry forests to the southwest and the Humid Chaco to the south. The Cerrado savannas lie to the north, east and southeast. Covering 21% of central Brazil, the Cerrado is the most extensive woodland-savanna in South America. 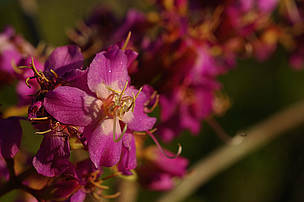 The region supports a unique array of plant species that have adapted to drought and fire. Large mammals such as the jaguar and maned wolf survive here but compete with the rapid expansion of Brazil's agricultural frontier and ranching activities. WWF is working to ensure that large parts of the Brazilian Cerrado are conserved. Cerrado savannah flower. Juruena National Park, Brazil. The Pantanal covers an area of up to 210,000km2 (or 81,000 sq. miles). It is 10 times the size of Florida's Everglades. The Pantanal is home to about 3500 plant species, 656 bird species, 325 fish species, 159 mammals, 53 amphibian and 98 reptiles. Average yearly rainfall is 1,000-1,400mm (40-55 inches). Over 80% of the Pantanal floodplains are submerged during the rainy seasons. The name "Pantanal" comes from the Portuguese word pântano, meaning wetland, bog, swamp or marsh.